It’s been a busy month for the EV market as BMW, Audi and now VW have all revealed details on future plans and concepts for electric cars. The German car industry is coming for Tesla, and you can bet they are worried in California. 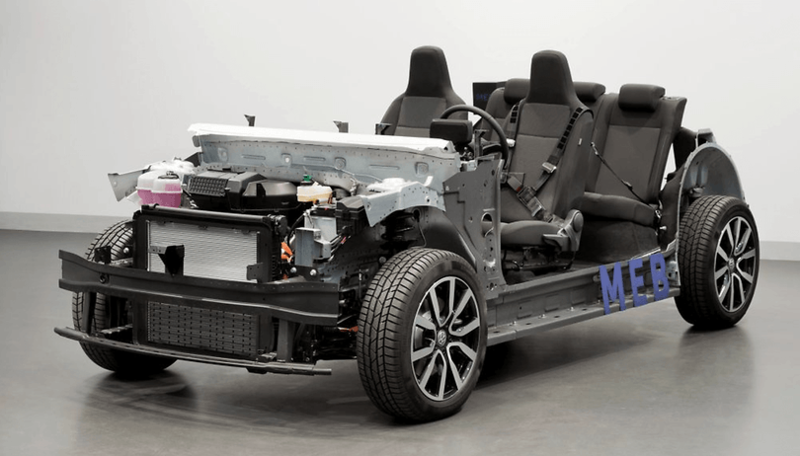 Volkswagen has revealed its modular electric drive matrix (MEB) platform and the Wolfsburg-based manufacturer is calling for ‘electric for all’. VW says it plans to bring millions of “attractive models at affordable prices” to drivers of the future. The system is used as a base for the production versions of VW’s I.D concept electric vehicles. The images show the electric-powered chassis without any bodywork or interior. VW says that this is exactly how it will be used in its series models. The first mass-market EV, which is expected in 2020, will probably be a Golf-sized vehicle. The manufacturer also unveiled the I.D VIZZION sedan, a crossover all-electric I.D called the CROZZ Concept and an electric microbus, the I.D BUZZ, scheduled for 2022. "The I.D will be a milestone in technological development. It will be the first fully connected electric car with full everyday utility that millions of people will be able to afford. The car holds the road really well thanks to the flat battery in the floorpan and the space inside is much more generous – we are making substantial headway with the sense of spaciousness." Thomas Ulbrich, Brand Board Member for E-Mobility at VW, compared the MEB to the transition from the Beetle to the Golf in terms of significance in the manufacturer’s history. VW already sells an e-Golf, a car that has been converted from its gas-powered platform. It’s taken the traditional automakers a while, but the big boys have finally turned up to crash Tesla’s party. Audi. owned of course by Volkswagen, unveiled its electric SUV in California this week with integrated Alexa. BMW is also entering the market with its iNEXT Vision concept, as our editor saw in Munich last week. Volkswagen probably has more ground to make up than anyone in terms of convincing consumers it can make green vehicles. The diesel emission scandal, which resulted in the German company paying a settlement of $15.3 billion, has impacted the brand and makes this new electric venture even more important for VW. What do you think of Volkswagen’s MEB platform? Are you ready to switch to an electric vehicle?